War of Shadows is the haunting story of a failed uprising in the Peruvian Amazon—told largely by people who were there. Late in 1965, Asháninka Indians, members of one of the Amazon's largest native tribes, joined forces with Marxist revolutionaries who had opened a guerrilla front in Asháninka territory. They fought, and were crushed by, the overwhelming military force of the Peruvian government. 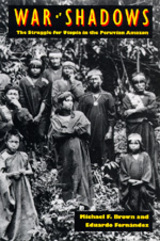 Why did the Indians believe this alliance would deliver them from poverty and the depredations of colonization on their rainforest home? With rare insight and eloquence, anthropologists Brown and Fernández write about an Amazonian people whose contacts with outsiders have repeatedly begun in hope and ended in tragedy. The players in this dramatic confrontation included militants of the Movement of the Revolutionary Left (MIR), the U. S. Embassy, the Peruvian military, a "renegade" American settler, and the Asháninka Indians themselves. Using press reports and archival sources as well as oral histories, the authors weave a vivid tapestry of narratives and counternarratives that challenges the official history of the guerrilla struggle. Central to the story is the Asháninkas' persistent hope that a messiah would lead them to freedom, a belief with roots in eighteenth- and nineteenth-century jungle rebellions and religious movements. Michael F. Brown is Professor of Anthropology at Williams College. He is the author of Tsewa's Gift: Magic and Meaning in an Amazonian Society (1986). Eduardo Fernández is a development anthropologist and the author of Para que nuestra historia no se pierda (So That Our History is Not Lost).